Antares is the bright star at the lower left of the image. It is over 700 times the diameter of our Sun. Globular cluster Messier 4 is seen on the lower right. 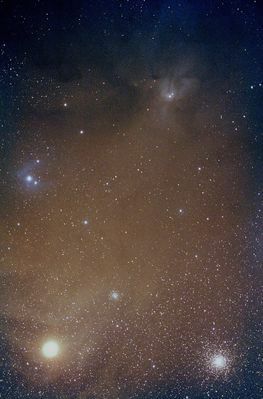 The Rho Ophiuchus cloud complex is the closest star forming region to our solar system (~430 lght years away). The cloud complex is much larger than can fit in this image. Blue reflection nebula IC 4605 seen about mid-left, and IC4603 seen middle-top are created by interstellar dust. Borg 71FL astrograph with a modified Canon XS DSLR 36min exp.